In 2011, Susan was invited to speak at the BlogPaws pet bloggers conference in Tyson’s Corner, Virginia. She spoke about self-publishing with two other publishing experts. 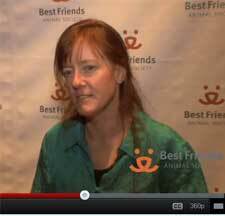 In 2009, Susan was invited to speak at the No More Homeless Pets Conference in Las Vegas that is put on by Best Friends Animal Society. She presented a workshop called “The 7 Habits of Highly Effective Fundraisers” which was based on information in her book Funds to the Rescue: 101 Fundraising Ideas for Humane and Animal Rescue Groups. Comments from Susan were included in the closing video at the conference (about 2 minutes in). Organizer, host, and presenter of the Self-Publishers Online Conference (SPOC). Teleseminars with humane experts for members of the National Association of Pet Rescue Professionals. Teleseminars with publishing experts for the Small Publishers Artists and Writer’s Network (SPAWN). This page has a list of teleseminar and speaking topics.